At Fairview Sailing, we pride ourselves on having one of the most varied fleets in the UK, meaning our customers get a good range of yacht to choose from when sailing on a yacht charter in the UK. Each of our yachts is meticulously maintained to the highest standards and are up to date with all safety certificates and requirements, enabling our sailors to spend time doing what they do best – sailing! To help you choose the right yacht for your next charter with Fairview, we’ve pulled together an overview of our fleet, listing each model in size order, from largest to smallest vessel, so you can opt for a yacht that suits your party’s needs and size and your overall objective, whether it’s sailing down to the South West coast of England or the Channel Islands on a seven-nights charter, or blasting up the River Solent to Beaulieu from out base in Port Hamble on our luxury RIB. Whatever your requirements, we are sure to have something perfect for you. Introduced into the fleet in early 2019, our beautiful Dufour 460 GL, ‘Oarsome Dream’ is the perfect cruiser for larger parties looking for a comfortable passage. This 14-berth yacht is the ideal vessel to charter if you’re looking for a more social sailing experience, with a large saloon area, spacious deck and all of the mod cons you’d expect from a new Dufour yacht. With two triple cabins in the forward section, a bunk cabin midships that sleeps two and two comfortable double cabins to the aft, this yacht makes the most of space and can sleep a further two guests in the convertible salon area. Complete with three heads, an equipped galley area, hot water and heating, this yacht is a real gem and an exciting addition to the Fairview fleet. Awarded the European Sailboat of the Year for family cruiser, the Oceanis 45 is a large yacht with sleek lines and exceptional comfort and speed, perfect for a longer passage on voyages to the Channel Islands and further along the south coast. Complete with four cabins suitable for up to 10 overnight guests (12 for a day sail), the Oceanis 45 has two heads, a spacious saloon area, comfortable galley with twin hob, fridge and hot water and all amenities you’d expect on a Fairview yacht. On deck, enjoy the view from the spacious cockpit area where you can enjoy an ice cold beer as you watch the sun set. Arriving into the fleet in spring 2019, our new Dufour 430 GL, ‘Rever’ is a comfortable yacht, with a spacious interior and accommodation for up to 10 guests. The saloon area can be converted to accommodate a further two guests and there is a separate seating area, meaning that space won’t be compromised if entertaining to full capacity. Fitted with two heads, hot water, heating and a fridge, the yacht also boosts a large cockpit area, ideal for you and your party to sit out on deck and watch the world go by. Our Elan 434 arrived with us in 2008 and has been a hit with customers ever since. This attractive yacht is suitable for up to 10 overnight guests, with four double cabins and a convertible double saloon area, two heads and a large, comfortable sitting area, ideal for socialising on a Solent adventure. Complete with a comfortable galley area with hot water, twin hob and fridge, this yacht also enables guests to enjoy longer sailing passages, with a spacious cockpit and high freeboard which add to the interior volume perfectly. 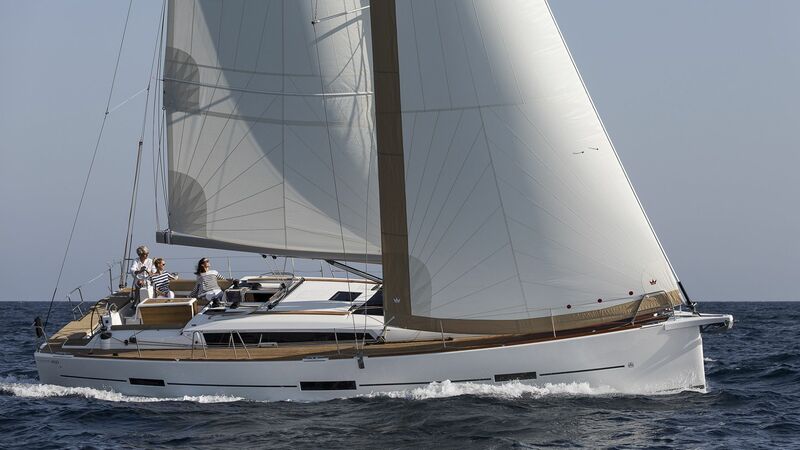 We are delighted to be able to offer our customers one of 10 Beneteau First 40 yachts, making the ideal charter vessel for those seeking the thrill and adventure that comes with matched regatta sailing. With an uncluttered deck layout and sleek interior, the First 40 comes complete with accommodation for up to six overnight guests in three double cabins but can comfortably welcome up to 12 individuals on a day sail. On board, you’ll find one heads, a comfortable saloon area which can sleep a further two overnight guests, hot water and a fridge, so your team can enjoy an exhilarating days sailing followed by an afternoon and evening of hospitality. The perfect vessel for sailing the Solent, our fleet of 20 matched Oceanis 37’s are great for social sailing and for corporate regattas. Fitted with eight berths and one heads, the spacious entertainment area is ideal for dining and socialising and comes complete with heating, hot water and a comfortable galley area. These yachts offer excellent sailing performance and are a favourite here with the Fairview team. Brand new to the fleet in spring 2019, our new Merry Fisher 795 powerboat is a luxury you won’t want to miss. The only Merry Fisher 795 available for charter in the UK, this is the perfect vessel to hop on board for an exciting day on the Solent, ideal for fishing trips or family days out. Built in ‘Pêche Promenade’ style, the interior cockpit acts as the perfect point to enjoy the coast from behind the luxurious aft double doors and with a comfortable dining area that can be converted to a double bunk, is suitable for up to four guests. The 150hp engine is ideal for powering across to the Isle of Wight or down to Lymington and the fitted fishing rod holders, small galley space with hob burner and fridge mean you can enjoy a spot of mackerel fishing along the way before cooking up a delicious feast in the evening. Our two Dufour 382’s, ‘Hamble Dream’ and ‘Solent Dream’ are a beautiful addition to the Fairview fleet and popular with day sailors. With a large forward double cabin and two double cabins to the aft, these yachts come with one heads, a spacious galley, hot water and heating, and are an excellent vessel to sail the Solent. The yacht has a spacious cockpit, perfect for enjoying the beautiful sights of the Solent on a warm summer’s day. New to the fleet in autumn 2018, our Zodiac Open 7M RIB, ‘Leatherback’ is truly the four x four of the sea! Complete with fore and aft seating, a comfortable cockpit, DAB radio system, Garmin navigation and plenty of storage for your gear, this wonderful vessel if the perfect way to explore the south coast of the UK for those looking for a bit more of an adventurous day out, with its 175hp engine. Probably one of the most comfortable yachts of her size, our Bavaria 36 is an ideal vessel to charter for shorter passage across to the Isle of Wight or across to Portsmouth. Fitted with three comfortable double cabins, one in the forward section and two in the aft, this yacht is a great addition to our fleet. The spacious saloon area can be converted to accommodate a further two overnight guests and is complete with a galley area with twin hob, oven and fridge, one heads and a separate navigation area. On deck, the cockpit is comfortable and an ideal place to take in the sights as you sail majestically along the Solent. Welcome on board our Dufour 36, am elegantly designed yacht, perfect for smaller groups looking for shorter passages and day sailing. Complete with three double cabins, one forward and two aft, one heads and a comfortable saloon area which can accommodate a further two overnight guests, this yacht makes the most of its space while offering an exciting sailing experience. On board, you’ll find twin hob, oven, fridge and hot water, so you can make the most of your time at sea in comfort. On deck, the curved hull is ideal for diving into swells for an exciting sailing experience. A great little yacht, perfect for smaller parties looking to spend the day exploring the beautiful locations that the Solent has to offer. The interior design makes the most of its space, with two double cabins, one forward and one aft, a comfortable saloon area, separate navigation table, a galley, complete with hob, oven and fridge, heating and one heads. The convertible saloon area can also comfortably accommodate a further two overnight guests. On deck, the cockpit is a great place to steer your yacht along the Solent while socialising with friends and family. If you’d like to charter one of our yachts or find out more about them, contact us today on 02380 457023 or email info@fairviewsailing.co.uk where one of our team is waiting to talk to you.